Quickesign is a very affordable yet robust digital signage solution. Create a dynamic layout for your TV with your images, videos, text, data, and audio; and add weather, news, Instagram, and Twitter widgets. Enter your username or email and we will send password recovery instructions. Schools, libraries, churches, restaurants, and offices are building professional displays using Quickesign. You can manage your content from anywhere and automatically update your displays. Plans start at just $5 per month for a single display. Displays can be a simple slideshow of images, or more engaging with sliding text, Twitter feeds, Instagram, videos, weather, MP3 music playlist, and more. You can schedule your playlist to automatically update at different times of the day. Enterprise users can add additional users to their account and give them permission to certain devices or scripts and receive text or email notices if a device is not updating. Get started quickly and affordably. You need one or more TVs with an HDMI port. Quickesign supports both horizontal and vertically positioned TVs. This can be a Roku Smart Tv. 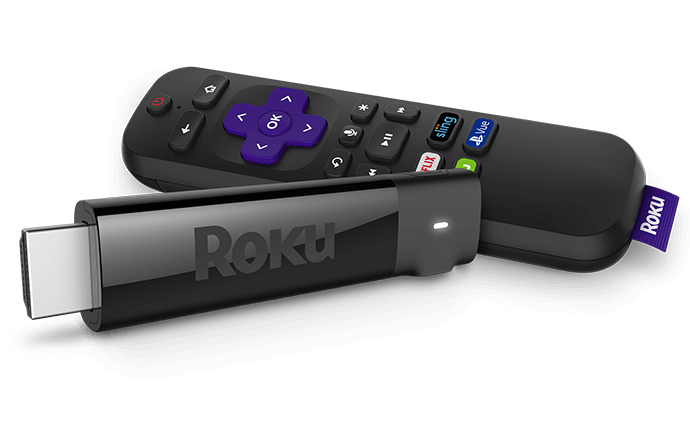 If it is not a Roku Smart TV, you can make it smart with a Roku Stick or other device. This version of Quickesign is optimized with the newest technology to work with Roku devices - Roku Sticks, Roku TV, Express, etc. 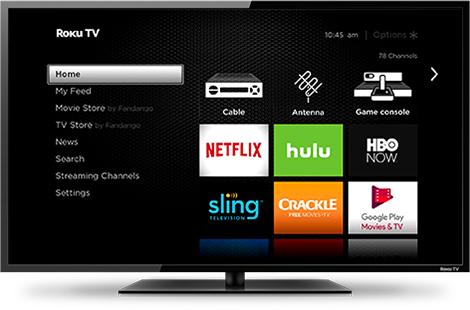 Most features work on all devices, although the Roku TV and Express models have a some small limitations. NEW - now available for Amazon Fire TV. Add the app to your Roku device. The app will communicate with Quickesign.net to get your content as you make changes and download current updates to weather, your Twitter feed, Instagram, and RSS feeds. 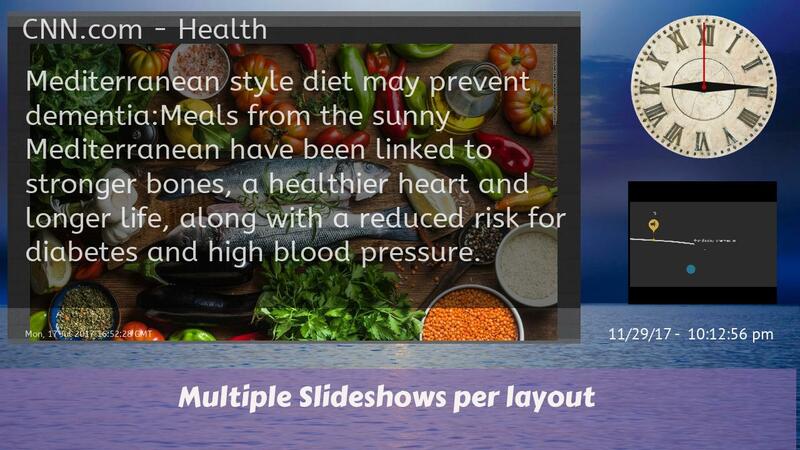 Zoned Horizontal - Screen organized in "zones" for multiple slideshows, videos, sliding text, widgets, etc. Simple Vertical - vertical TV with full screen slides. Great for menus. 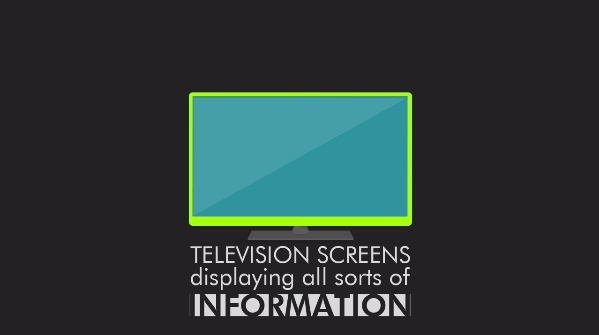 Zoned Vertical - vertical TV with layout organized with multiple slideshows and text. Note, some features not available with vertical display. Add the free Roku Channel to your Roku Device. You can then link it to your Quickesign.net account. Save 17% with an annual plan. Price is per device with volume discounts starting at 3 devices. Volume savings up to 50% off. 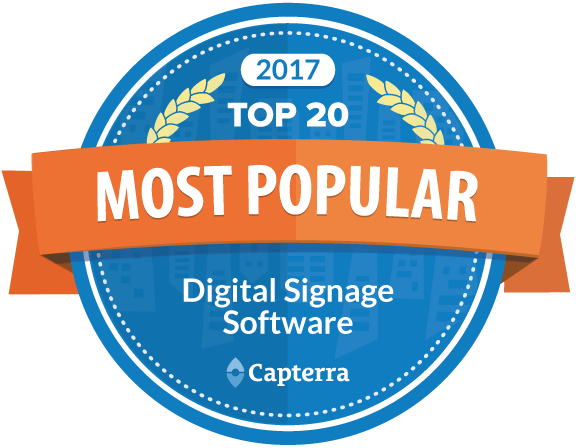 “After reviewing many options for creating and managing multiple digital signs at various remote locations, we decided on QuickESign. For the relatively low cost of TV’s with Roku and WiFi built-in, and an Enterprise license, we can share the responsibility of managing the content on the digital signage in each of our driver lounges. Each change to the sign layout is pushed out to the necessary signs automatically. Customer support is very responsive and made sure I was comfortable with the software during my trial. For a low cost, easy to use solution, you can’t beat QuickESign. I highly recommend this program. Mike Averill, Danny Herman Trucking, Inc.
Pros: Low cost, ease of use. Cons: Not much. We were one of the first users and features were spartan and some things didn't work well. Now everything has been fixed and features have been added. Overall: We looked at other systems and the upfront and ongoing fees were very high. The ease of use and cost of QuickESign made it an easy sell. Fantastic customer service. I highly recommend QuickESign. Recommendations to other buyers: Spend some time getting to know the interface and you will have a nice presentation. Pros: It does exactly what it is supposed to and you do not need to know any code to make it work. Overall: Clients & customers in our shared business space really like the signage. It pops. My questions were answered live and were very, very helpful. I have recommended QuickESign to more than one person since I started using it. The value is there, the price is very reasonable.